Finding art materials in nature is rather exciting. Here at ZiggityZoom, there is nothing we love more than to create a piece of art from a found rock, stick, shell or pine cone. It truly is amazing to turn something rather mundane into a wonderful or amusing piece of artwork. 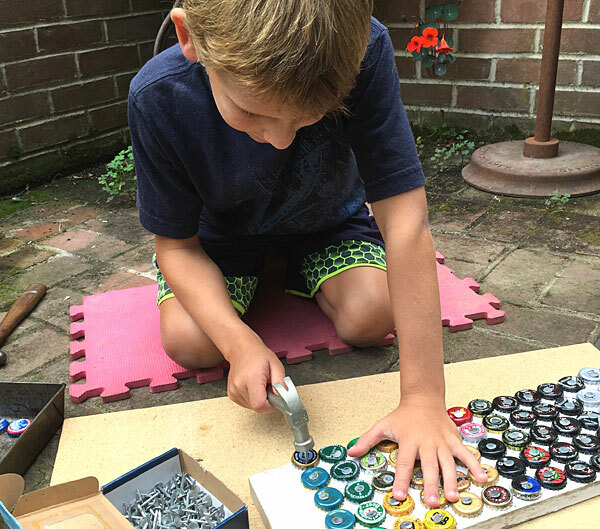 Kids love this process so it is always good to start from the beginning … the search. For the projects we are highlighting here, we started with a drive to a local creek. The kids spent about an hour searching for their own special rocks. I’m not ashamed to say that by the end of the hour, I had three times as many as anyone. Yes, I still love rocks! But we all had a great time rock collecting. We went home and then dropped our rocks into individual buckets (so they didn’t get mixed up with anyone else’s selections) of water. We rinsed the rocks and dried them in the sun prior to starting our rock art projects. While they were drying we looked through Pinterest to find any interesting craft ideas for our rocks. 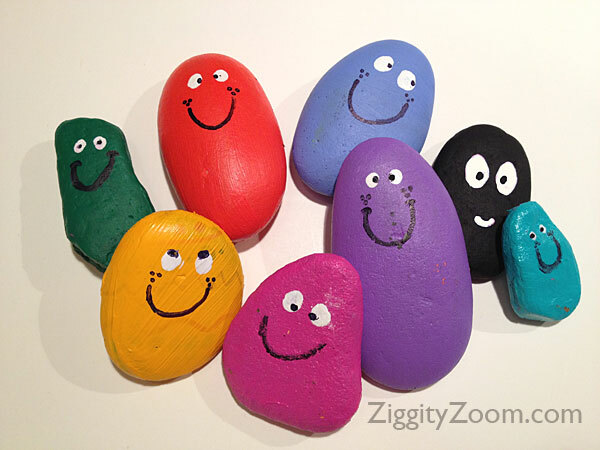 Our favorites ended up being some cute but simple painted Rock Buddies, a Rock Guinea Pig and a Rock Family. We also decided to try making some Rock Animals using the rocks and some sticky-back foam. One of the projects we knew we wanted to make ahead of time was a Rock Family so we specifically made sure to choose both small rocks for heads and medium size rocks for bodies. This rock project turned out sooo cute. It really is my favorite. 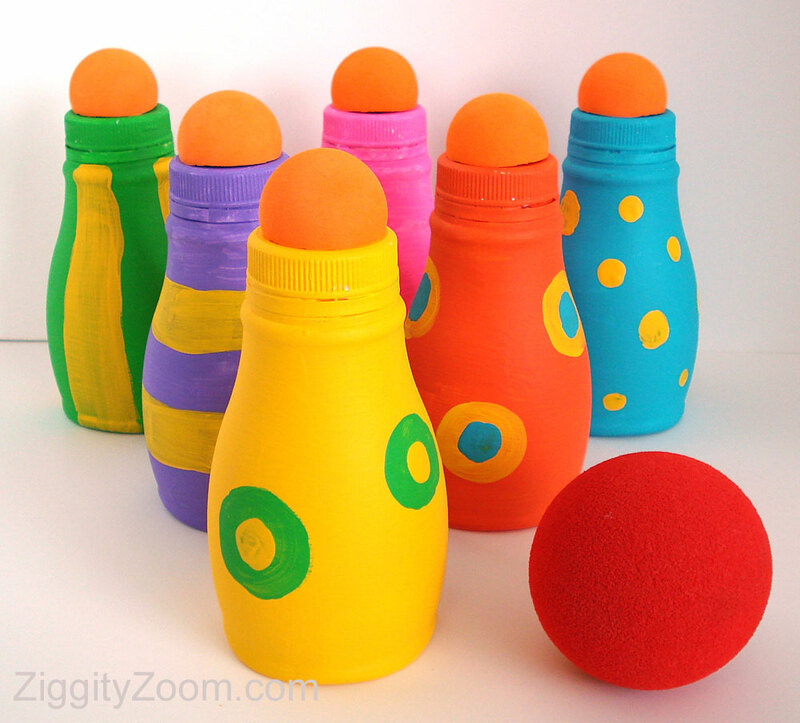 Not only are the little painted families so cute but kids can play mix and match with the heads and bodies for some extended play. 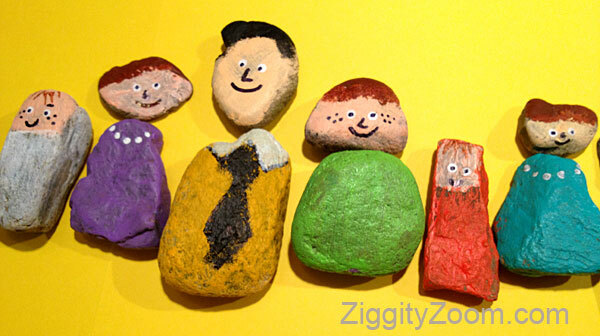 I have to admit that Julia’s little rock family turned out even cuter than mine … and she even made some babies for her pretend family. Once your rock family is finished, just store them in a container so they stick together when they aren’t being played with. It’s hard to believe that we had so much fun with rocks for days. 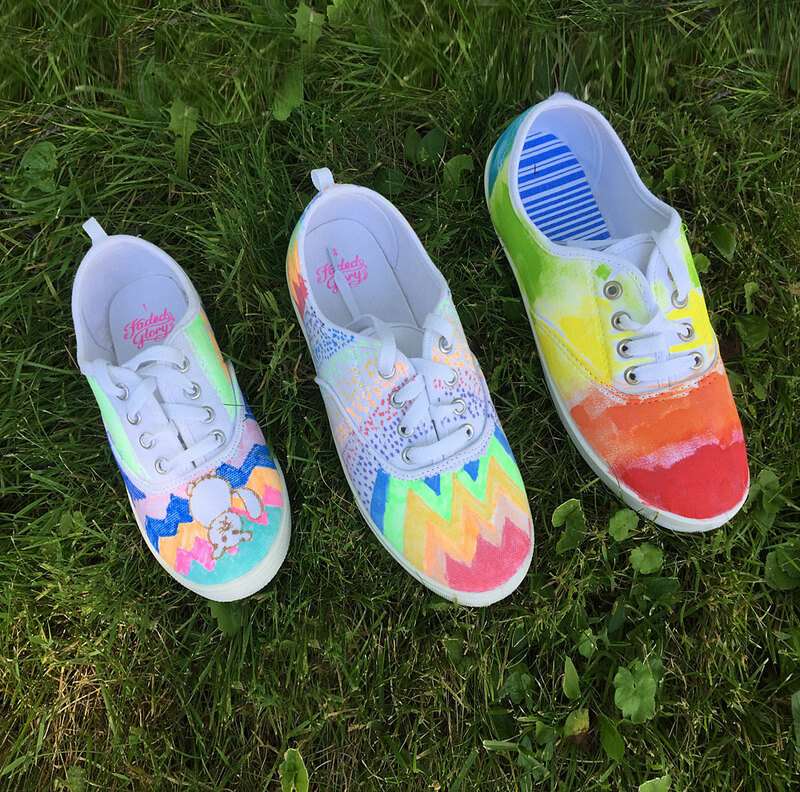 This rock painting activity is really great for a summer craft project, a camp craft project or even a girl scout project. 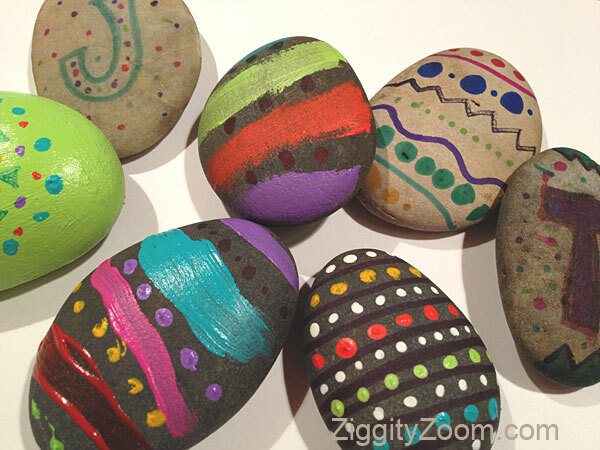 Another fun idea is to just paint pretty designs on the rocks using bright acrylic paints. You can even do a name rock collection … using a different letter on separate rocks. A rock name would be fun for giving or displaying on a desk or shelf. 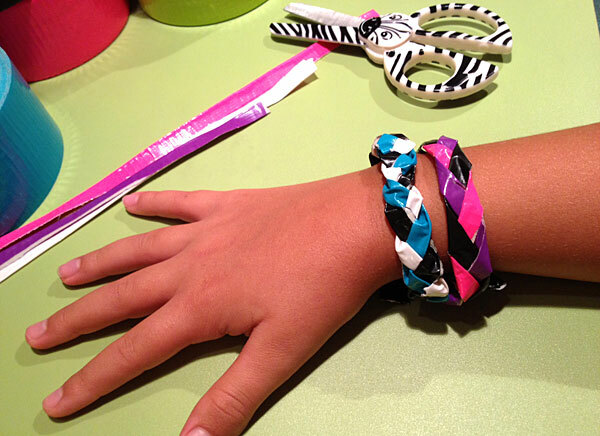 For educational purposes, why not make the whole alphabet, numbers, colors and shapes? Little ones can then play games and reinforce these early concepts while playing. Perfect for tween girls, these little Rock Buddies are perfect for a whimsical touch to add to their bedroom. Our girls were anxious to make some of these and give them to their friends and they even gave them all names and printed the names on the backs of the buddies. 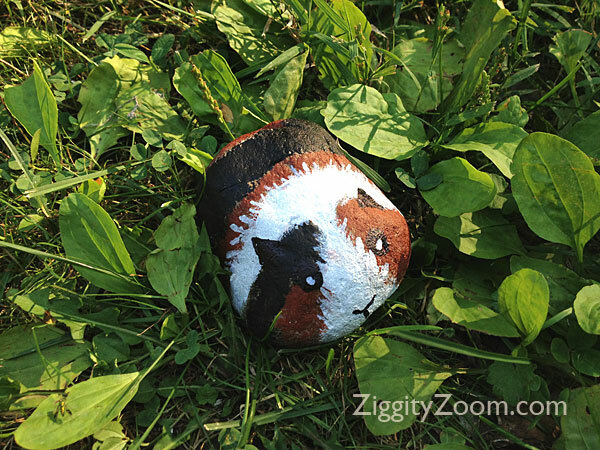 Although one of the kids made a guinea pig pet, you could turn a rock into any little animal, like a mouse or a chipmunk. This little guy turned out so cute, didn’t he? All you need is a rock, some paint and a brush. Snap, that’s it! 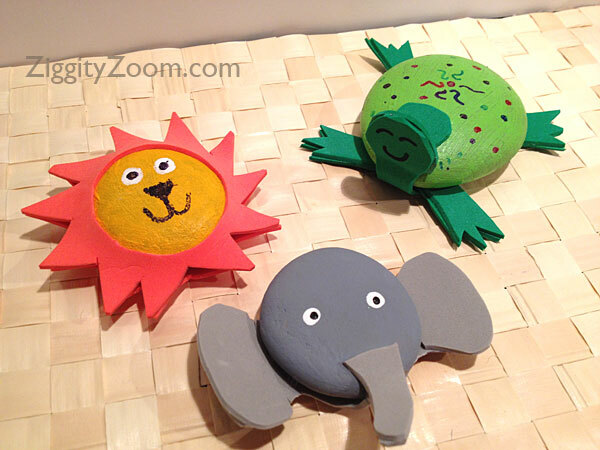 The girls chose to make an elephant rock pet, a lion rock pet and a turtle rock pet but you could make virtually any little animal pet using just a rock and some sticky-back foam. We used two pieces of foam and then cut away just a section that would stick to the rock. The rock, of course, just needs to be painted first and let to dry.